Standard Packing: 50pcs/Carton or Meet Customer's Requirement. 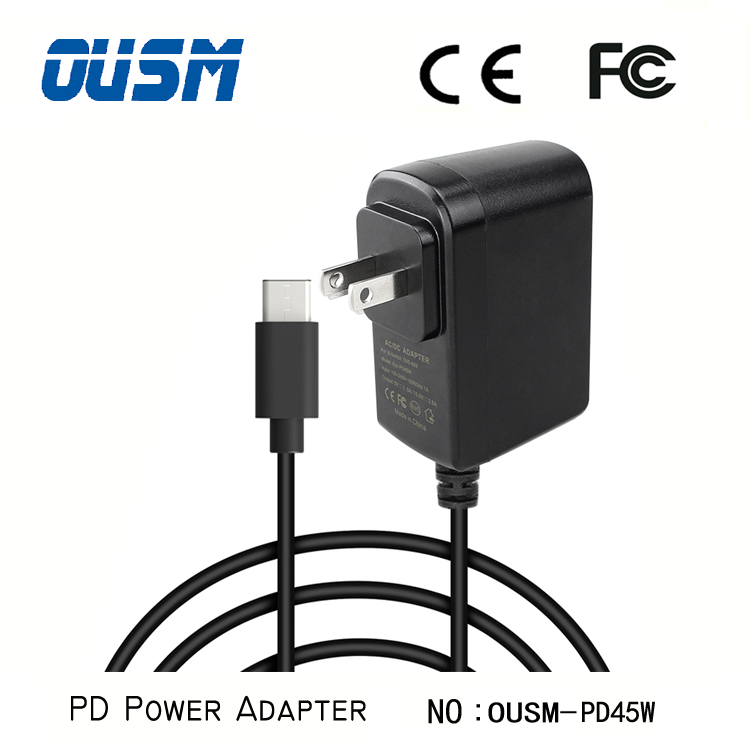 OUSM PD charger - Typc C Interface Fast Charge Transmission Equipment (Power Adapter) - A variety of charging voltages 5v 9v 10v 12v 15v 20v - PD 3.0 fast charge agreement,support PPS, QC4.0-Maximum power 45W. 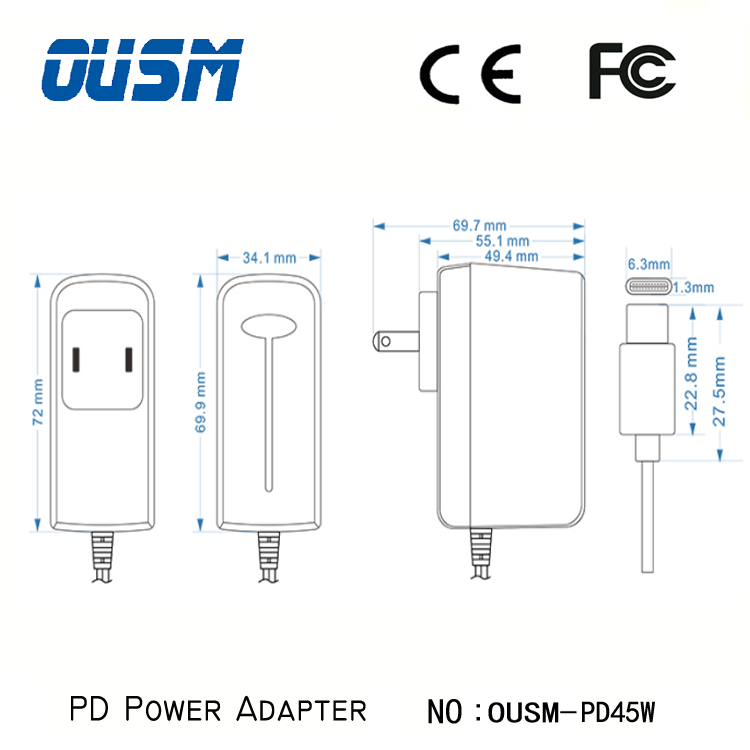 OUSM-PD45W Adapter is a wall charger that researched and designed for Switch Game console matching products,Laptops,Smart Mobile Phones etc.This product is used for Switch Game Consoles,Switch Game Handle,Switch Game Console Base,Smart Mobile Phones,Laptops etc,QC charger,It can be playing while Charging. 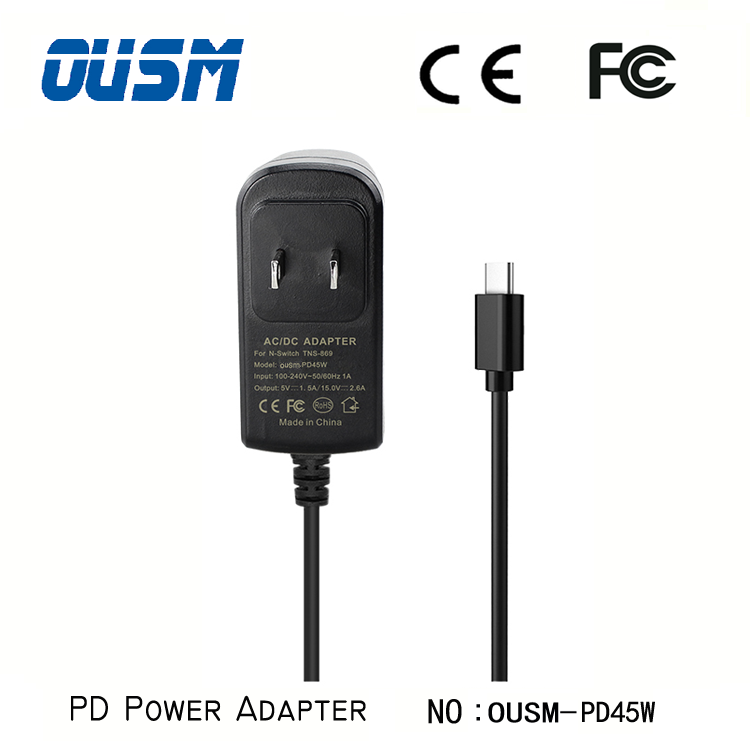 OUSM power adapter can widely adapt to the 100-240V voltage,and meet the power supply demands in different countries and regions.Fulled voltage and current,protect the equipments from damage,take it with you when you travel. Product features:PD3.0 protocol. Support PPS. QC4.0 fast charging technology. QC4.0 has also added a variety of security enhancements. 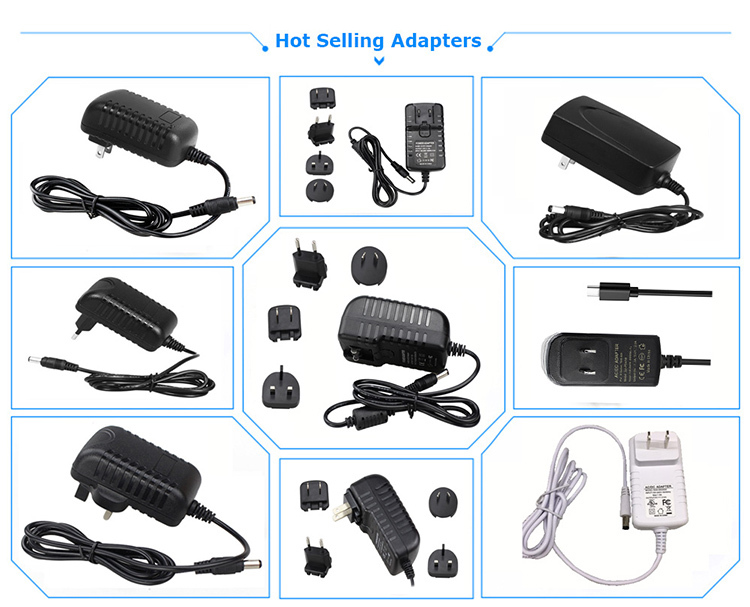 And through the special design to prevent charging high temperature ; When no-load output is 0. eliminate plug ignition equipment damage. 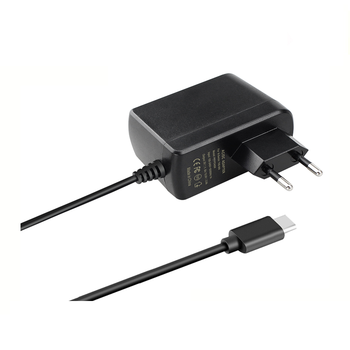 Automatic identification of terminal equipments,output suitable voltage and current,bid farewell to the efficiency of charging problems! 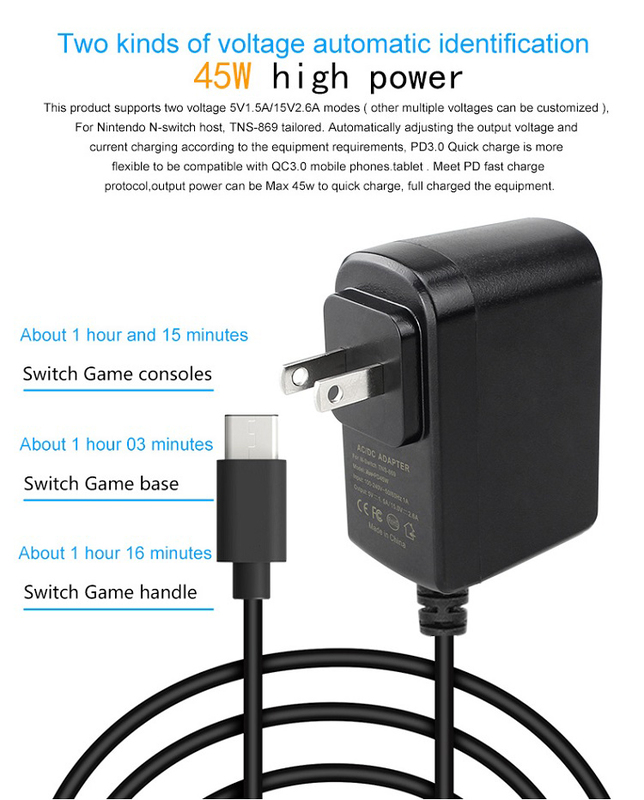 Reach to charge ten minutes,and can play for two hours! 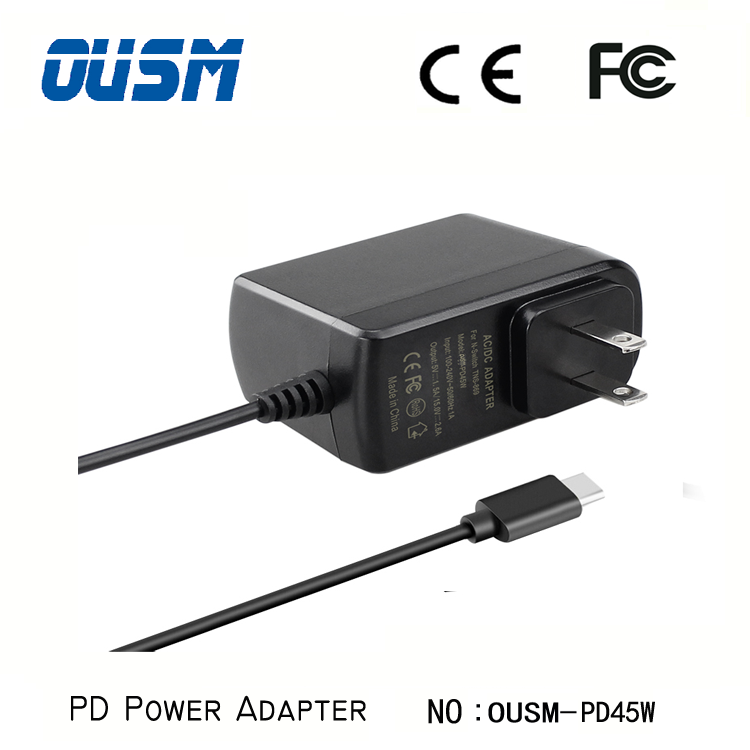 OUSM power adapter (PD45W) completely new upgrade,It is with some QC 4.0 to support the USB power transmission (PD) 3 M standards USB PD is with programmable power supply (PPS),can make the communication between the smartphone and the charger The protection system is upgraded safely and has longer service life. 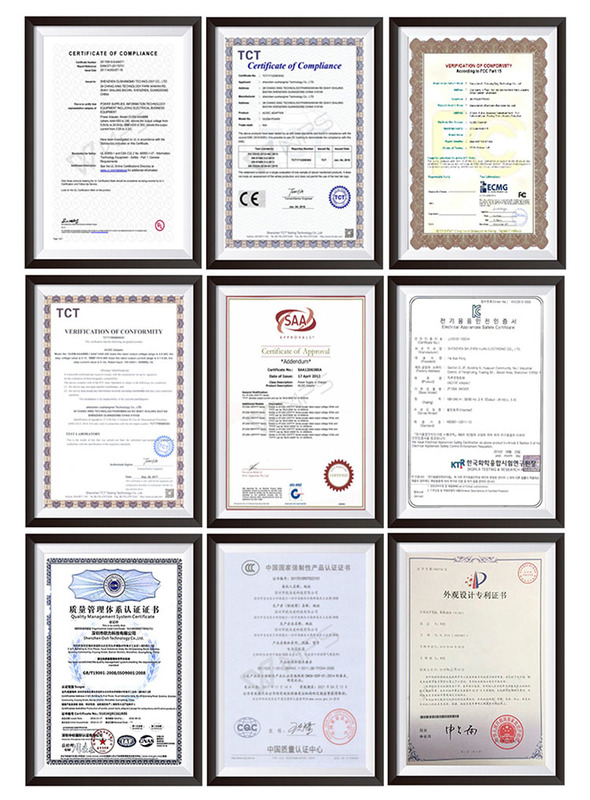 CE FCC RoHS Certification is fully guaranteed quality. 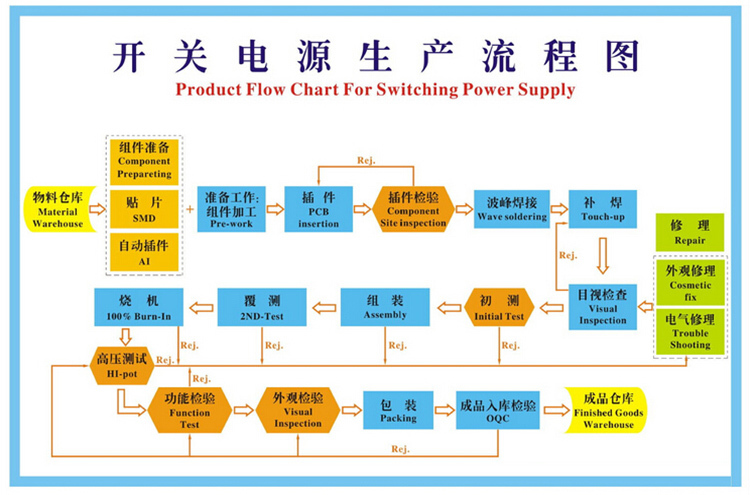 This product supports two voltage 5V1 SA/l 5V2.6A modes (other multiple voltages can be customized). 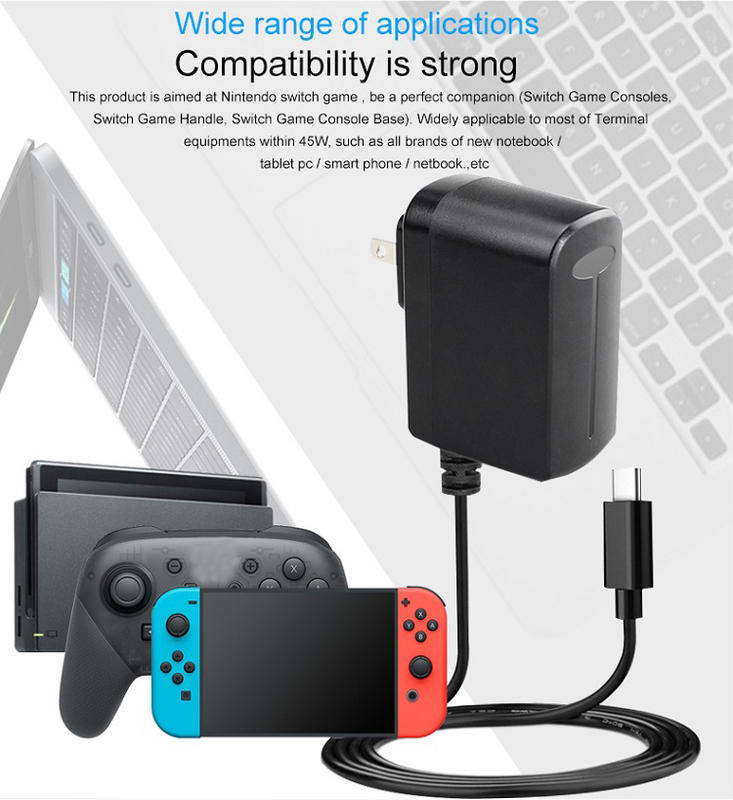 Automatically adjusting the output voltage and current charging according to the equipment requirements.PD 3.O Quick charge is more flexible to be compatible with QC 3.O mobile phonestablet Meet PD fast charge protocol,output power can be Max 45w to quick charge,full charged the equipment. 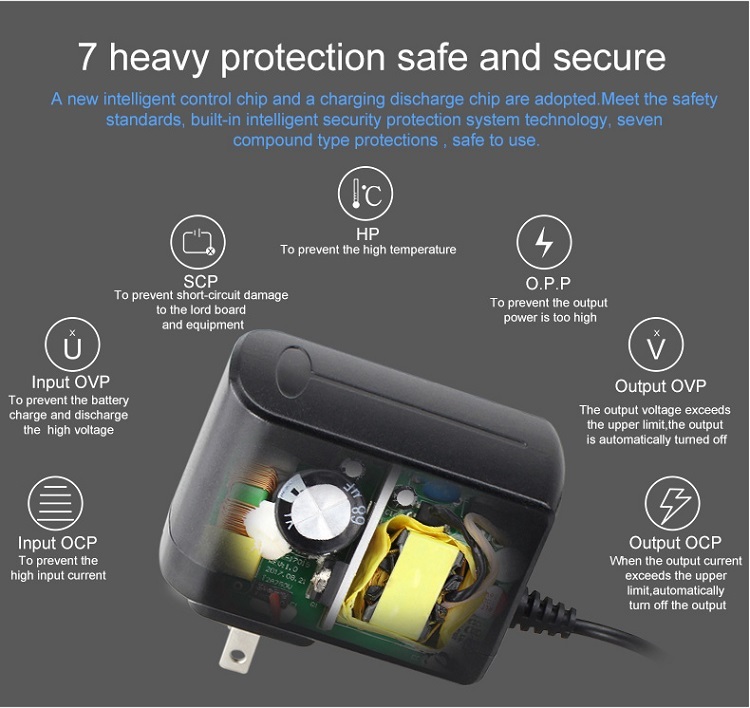 A new intelligent control chip and a charging discharge chip are adopted Meet the safety standards,built-in intelligent security protection system technology,seven compound type protections,safe to use. Input OCP - To prevent the high input current. 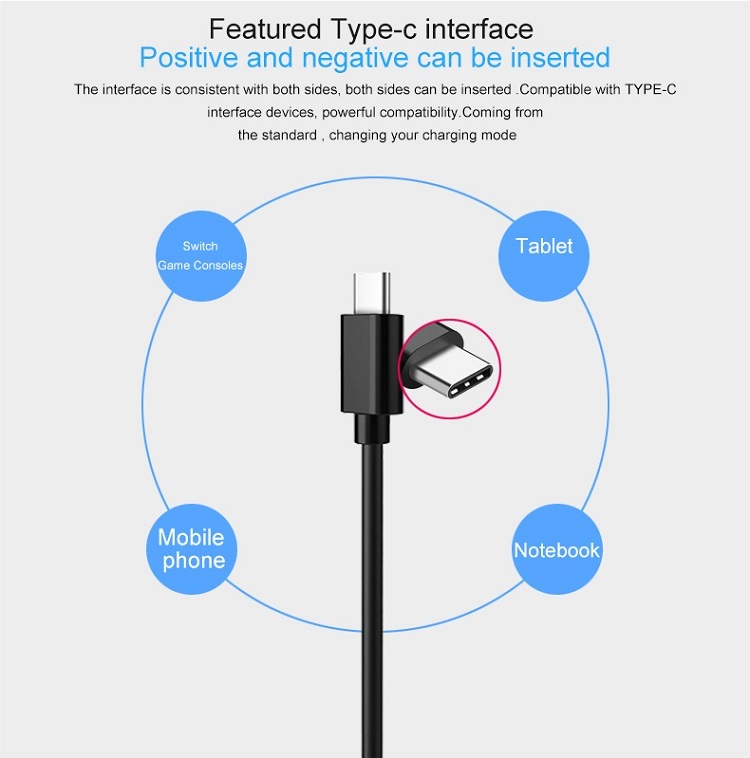 The interface is consistent with both sides,both sides can be inserted .Compatibe with TYPE-C interface devices,powerful compatibility. Coming from the standard ,changing your charging mode. The selection of raw materials is very strict. The shell is made of PC-ABS,high performance fireproof and high temperature resistant.Matenal integration,pass the UL-94V0 level test,meet the V-O fire rating standards,to prevent charging safety risks,so that you can use more assured. Internal uses the high quality chips,life will be increased by 1 times,the production process meet the national standards.The latest Level 6 efficiency,IC program,quality is excellent,durability is more durable. 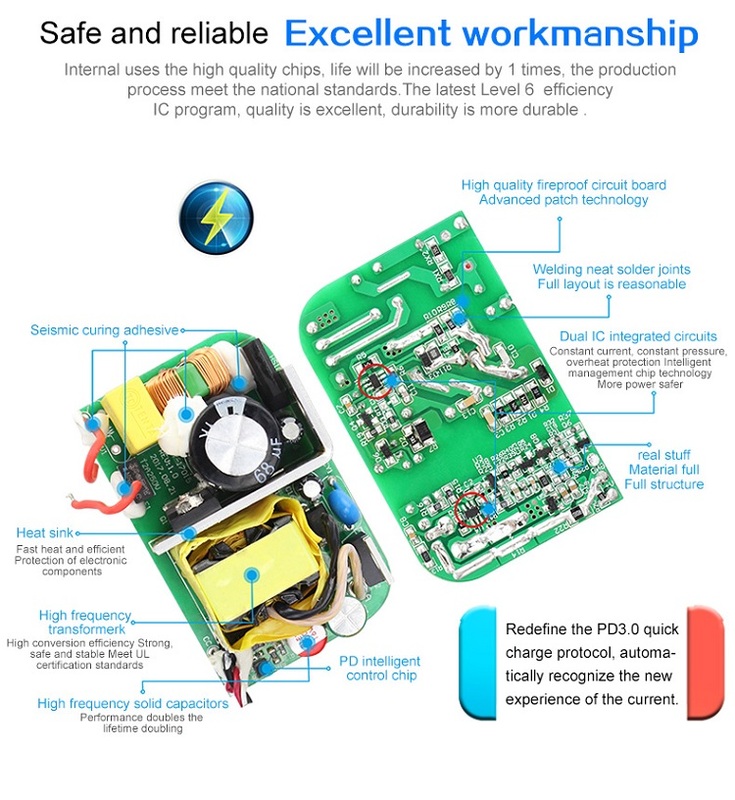 Redefine the PD3.O quick charge protocol. automatically recognize the new experience of the current.